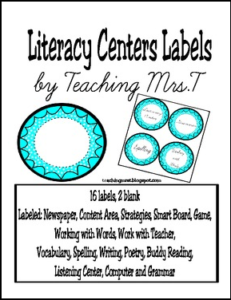 Use these cards to label your centers so your students can find them easily! No more, “where’s the spelling center Mrs.T?” This file includes 16 labels, 14 of them are labeled(Newspaper, Buddy Reading, Work with Teacher, Vocabulary, Grammar, Computer, Game, Smart Board, Working with Words, Writing, Poetry, Listening, Strategies, Content Area) and two blank. There are 4 round labels per page. I would be happy to add any other names you use for your centers or change the color by request.